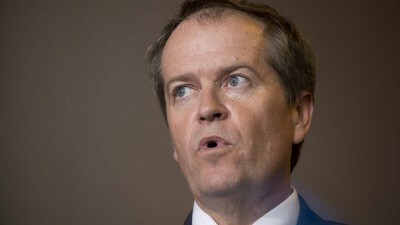 Labor’s Electricity Bill Shorten: candidate for PM? Or candidate for the local lunatic asylum?? His bumbling Environment Minister, young Gregory Hunt (thoroughly misguided by the pair of wind industry plants in his office) has set out to aid his boss, by putting some firmer numbers under the cost of Labor’s lunacy. Here’s a stab at what power consumers are in for, from Greg’s Department. Bill Shorten faces a renewed Coalition attack over higher electricity prices from his 50 per cent renewable energy goal, after Environment Department analysis found achieving it by 2030 would cost a “ballpark” $85 billion. Environment Minister Greg Hunt seized on the analysis, which costed producing 50 per cent of electricity, saying it showed the goal would be “incredibly expensive for families” and a “reckless” policy. The Opposition Leader announced the 50 per cent renewables goal at the ALP national conference last month but said Labor in government would consult on how to achieve it. The Environment Department finds that if Labor legislated a 50 per cent renewable energy target by 2030, consumers would pay $70bn in subsidies in addition to the subsidies they pay under the current RET. The analysis assumes wind would take up a significant proportion of the additional renewables generation capacity but large-scale solar would grow more rapidly. The analysis was based on today’s technology costs and the current cost of building renewable energy generation. Renewable energy currently accounts for about 16 per cent of electricity generation. Labor is banking on predictions of continued steep falls in the cost of solar and wind generation and the evolution of battery storage to ease the pressure on consumers. Separate analysis commissioned by the Minerals Council of Australia and conducted by economic consultancy Principal Economics found the renewable energy sector received subsidies (including the RET, feed-in tariffs and other green policy costs) worth $2.8bn in 2013-14. The renewable subsidies translated into almost $412 per megawatt hour (MWh) for solar technologies, $42 per MWh for wind and $18 per MWh for all other renewable sources (including hydro). By comparison, coal-fired power received less than $1 per MWh and natural gas less than 1c per MWh delivered. Principal Economics found that in 2013-14 these renewable energy subsidies added between 3 per cent and 9 per cent to the average household bill and up to 20 per cent for some industrial users. MCA chief executive Brendan Pearson said increasing renewable energy was laudable. “But renewable energy must win increased market share on its own merits, not be guaranteed it by expensive mandatory targets and feed-in­tariffs, the cost of which is simply borne by householders and industrial users,” Mr Pearson said. The Environment Department analysis suggests an additional 15,000MW of wind power would be built at a cost of $20bn requiring another 5000 wind turbines to be installed around the nation. It estimates an additional 25,000MW of large-scale solar would be built at a cost of $40bn. But it does not give costs for augmentation of the electricity network required to cope with the increase in renewables or the cost of additional baseload renewables. It estimates electricity demand will be 298,000GWh by 2030 requiring a large scale renewable energy target of 113,000GWh. The remainder of the renewables quota would be made up of 15,000GWh in pre-existing hydro-electric power and 20,000GWh from small-scale solar such as rooftop panels and hot water systems. The Environment Department described as “broadly reasonable” ACIL Allen estimates, published in The Australian last month, that 50 per cent renewable energy would cost between $65bn and $100bn depending on the technology mix. The department said meeting the 50 per cent goal by exclusively building wind generation would cost about $65bn with the cost rising as more expensive technologies such as solar were used. “The truth is this will be incredibly expensive for families, and Labor knows this,” Mr Hunt said. Opposition environment spokesman Mark Butler rejected charges of spiralling electricity costs because of growing renewables generation, arguing the Warburton review of the RET had found it led to lower wholesale electricity prices. However, energy experts have pointed out that the cost reductions flow from the fact that renewables projects are increasing capacity in an already oversupplied market. Labor is banking on the cost of solar panels continuing to halve every seven years and the continued reduction in the cost of battery storage. Labor is also banking on more homes storing their own power rather than relying on the electricity grid to underpin its policy. Mr Butler last month argued that many coal and gas-fired power stations were reaching the end of their lives and would need to be replaced. Sid Maher is one of The Australian’s reliable ‘plodders’ – who has had a fair bit to say about the wind industry; and the Large-Scale Renewable Energy Target – but who also seems quite happy to simply reproduce political press releases; and the drivel pitched up by the Clean Energy Council. On this occasion, however, Sid appears to have stepped outside his comfort zone – by identifying two very significant aspects associated with the great wind power fraud – when he says that the cost estimate put up does “not give costs for augmentation of the electricity network required to cope with the increase in renewables or the cost of additional baseload renewables”. What a ‘dispatchable’ renewable looks like. 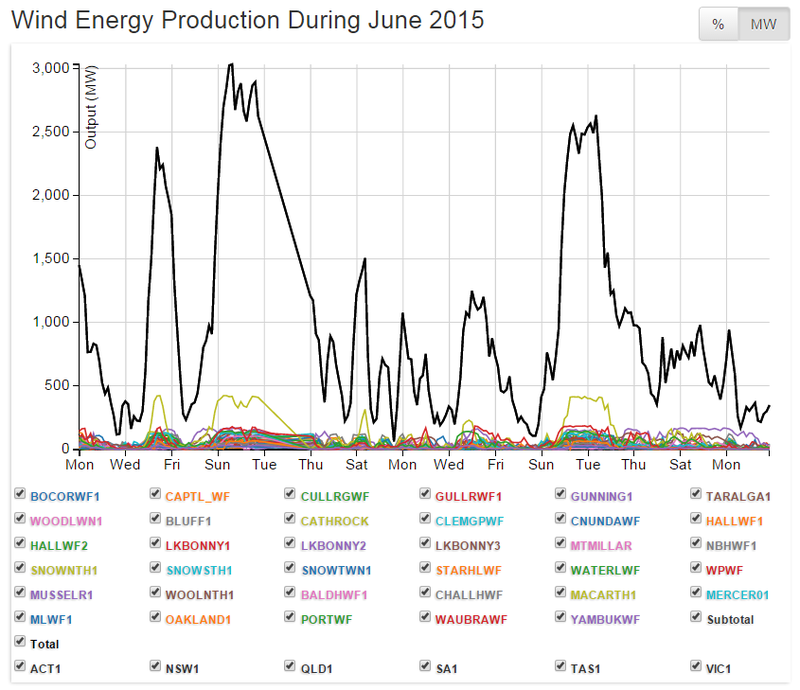 STT’s not quite sure where Sid is coming from when he talks about additional baseload renewables? The only serious “baseload renewable” in Australia is hydro; and Labor has absolutely no plans to upgrade or increase Australia’s hydro capacity. However, if he means to say that for every MW of wind power capacity, there has to be a MW of firm capacity, from a ‘dispatchable’ source (ie one that is available ‘on-demand’), then he is right on the money. And we’re happy to give Sid full marks for recognising the significance of the costs associated with duplicating (in reverse) and upgrading Australia’s Eastern electricity grid (that serves QLD, NSW, VIC, TAS & SA) to cope with power delivered (if at all) at crazy, random intervals, from wind farms spread over an area more than 2 ½ times greater than the UK. The report is also light on the number of these things required to meet either of the ridiculous renewable targets: the Coalition’s requires around 2,500 and Labor’s more than 10,000 – double that suggested in the piece above. There is no way that Australia’s current grid infrastructure could accommodate another 2,500 of these things, let alone 10,000. [G]et out there and build a new grid – big backbone powerlines – and then the wind turbines come. The problem in Australia is we look at a big windy area and say, “Oh, look, it hasn’t got any grid.” No individual developer can afford to build grid, so it doesn’t happen. So, in order for the wind industry and its parasites to get into the game and rake in fully subsidised profits, it’s down to power consumers and taxpayers to build a duplicated and completely unnecessary grid infrastructure; for an utterly meaningless power source. already battling to pay their power bills – have to bear it. But, it’s with young Gregory Hunt – a nominal ‘Conservative’ – that STT takes real issue. You see, Greg has adopted the wind industry’s standard tactic of “hey, quick look over there” – whenever its fronted with the cost and pointlessness of wind power. STT has never rated Greg’s intellectual power that highly, when it comes to the serious, grown-up business of energy, but he leaves us utterly gobsmacked, when he trots out childish inanities such as “renewable energy is good” …. sigh … read it again …. sigh, once more. Yep, he actually said it. As Greg seems to have a very loose understanding of what’s “good”, in the grown-up world of power generation, we’ll drop in a picture and put the poser: does “good” mean sitting freezing (or boiling) in the dark, more than 60% of the time? 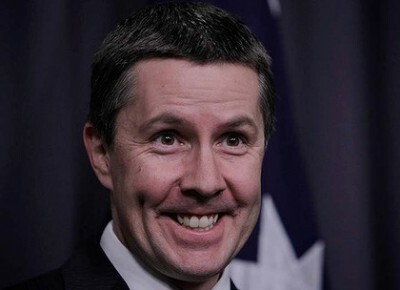 While Greg is quick to howl about the cost of Labor’s 50% renewables fantasy – when it comes to his own mandated madness – he’s a little like the protagonist in Bob Marley’s tune about shooting the sheriff, but not shooting the deputy. Putting your hand up for murdering the boss, and not his side-kick, is hardly one of the better criminal ‘defences’. So, Greg – why not front up – and fess up – that your LRET target is precisely the same species of economy destroying policy, as that pitched up by Labor? Come on Greg, why not tell them that your LRET target will inevitably drive power prices through the roof; send energy intensive businesses offshore; households into a dim, dark electricity free future – and kill off any hope of growth in employment, wealth and incomes. By way of Marleyesque comparison, the Coalition’s LRET shoots the sheriff stone dead; whereas Labor’s shoots and slays both the sheriff and the deputy. Here’s a little wrap-up from Alan Moran on just how expensive and pointless Australia’s energy policy has become. The debate on renewable energy has been with us for decades. Always promising to deliver competitive electricity, it has never achieved it. The issue has had its media profile lifted as a result of the government instructing its green energy bank, the Clean Energy Finance Corporation, to stop investing in wind and rooftop solar energy. These are established technologies that already receive a subsidy worth $52 per megawatt hour through the mandatory renewable energy certificates. This means wind generators get a price for their energy that is more than twice that of commercially supplied sources including coal, gas and hydro. The CEFC provides further support through its loans on concessional terms. The government’s instruction to the CEFC follows parliament’s agreement to maintain the renewable energy subsidy for up to 33,000 gigawatt hours a year of (mainly) wind energy, plus about 12,000 GWh of rooftop solar. Including the established and unsubsidised hydro schemes, this means renewable energy accounting for 23 per cent to 24 per cent of total supply by 2020. That is more than the 20 per cent set by the Rudd government in its 2007 target. The REC at its present price means a subsidy of $2.5 billion a year — almost enough to fund a small car for every teenager turning 18. And the effective price could easily rise from $52 to $92 per megawatt hour. Many Coalition MPs want to eliminate the wasteful renewable subsidy, while the government has made no bones about wishing to see the CEFC close its doors. Unfortunately, this is thwarted by opposition within the Senate, supported by the wide-eyed belief of many media commentators who see renewable energy as being low-cost and paving the way to a new energy future. The lower cost myth is fuelled by the renewable energy industry with modelling that shows the obvious: if a good is heavily subsidised it lowers prices of similar goods. Thus the subsidy for renewables drives down the spot price of all electricity because estab­lished power stations have to keep running. But when the existing power stations close, prices skyrocket. Environment Minister Greg Hunt has said he wishes to redirect CEFC funding away from wind and rooftop solar, which account for 30 per cent of its pipeline of new investments, into innovative emerging technologies. These include wave power, large-scale solar facilities, and perhaps the already heavily funded carbon capture and storage. The CEFC would rather concentrate on proposals with a less uncertain return. And it has a point, as it is unlikely that any of the exotic innovative and emerging technologies will make a commercial return. Large-scale solar facilities are at least 50 per cent dearer than wind, while the oceans will be no more likely than the atmosphere to be harnessed to produce energy economically. And carbon capture and storage as a technology has not even emerged from the test tube, let alone offered any indication of commerciality. There is an irrepressible optimism about new energy technologies that experience has failed to embitter. Back in 1986, the American Wind Energy Association predicted that by 1990 wind would be California’s lowest cost source of energy. Christopher Flavin, the former president of the Worldwatch Institute and doyen of the green energy fraternity, claimed in 1984 that wind farms would need no subsidies within a few years, as wind would soon be cheaper than fossil fuel-generated electricity. The ALP government-funded ClimateWorks only five years ago suggested that at a price of $9 a tonne of carbon dioxide, fully 24 per cent of industry emissions could be eliminated. Even at a price of more than $50, we are nowhere near this. Some maintain that all we need is for subsidies to offer a leg-up to promising industries that will then stand on their own two feet. But as far as the new technologies are concerned, Australia has a sad history of funding “infant industries” that assured the gullible paymasters they would soon sprout into full-fledged virile adults. All of them failed — textiles, clothing, cars, chemicals, wind turbine blades. Not a success story in sight. Australia cannot afford the costs of backing losers and subsidising high-cost technologies even if they have well-funded lobbying resources and tug at the hearts of a naive media. The government needs to cease financial support and technology winner-picking, thereby lowering regulatory and budget costs. Alan Moran is with Regulation Economics. 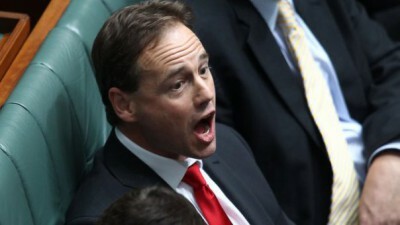 Greg Hunt: happy to howl about the cost of Labor’s lunacy. Now, how about telling Australians what YOUR LRET is going to cost them? We are a group of citizens concerned about the rapid spread of industrial wind power generation installations across Australia. The figures thrown about by Hunt & his opposite are fodder for the Green eyed voters they hope to seduce for the next election. Neither intend to deliver on the (core?) promise surely, or are they truly the economic and environmental vandals they appear? We respect your privacy. Email addresses are secure - and will not be passed on to any third party.